Baa Baa Black Sheep, have you any . . . songs? Children love to sing and be sung to, and these perennial tunes are always top the kids hit parade. Little ones will love the repertory that includes "Ive Been Working on the Railroad," "Pop! Goes the Weasel," and "Row, Row, Row Your Boat." And somelike "Itsy Bitsy Spider," "Pat-a-Cake," and "If Youre Happy and You Know It" are more than just fun: they develop physical dexterity and teach parts of the body, too. All the songs are great for entertaining restless youngsters on car trips, during play dates, or on a rainy day. Linda Bleck is one of the 12 illustrators whose work is featured in Goodnight Songs by Margaret Wise Brown (Sterling). She also illustrated all of our Children's Treasury titles. Linda brings over 30 years of experience to the field of illustration, and her work has been recognized by publications such as Communication Arts, Society of Illustrators, Print Magazine, and American Illustration. Her children's books have won the National Parenting Publication Award, Mom's Choice Awards, and Chicago Public Library's Best of Best Award. Linda lives in Mequon, WI. Visit her at lindableck.com. 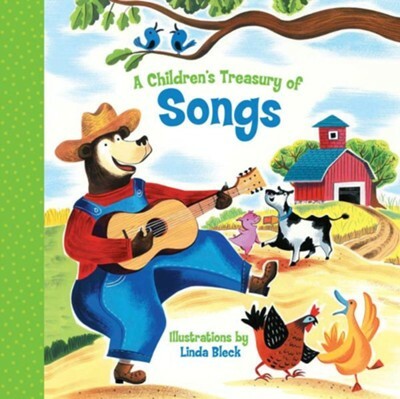 I'm the author/artist and I want to review A Children's Treasury of Songs.